Torrential downpour during the night as we slept just a meter and a half above the river level. But when we woke in the morning, we were just a half a meter from the water's edge. Time to get moving guys!!!! The rain lightened just enough to make it bearable for me to ride on the handlebars. 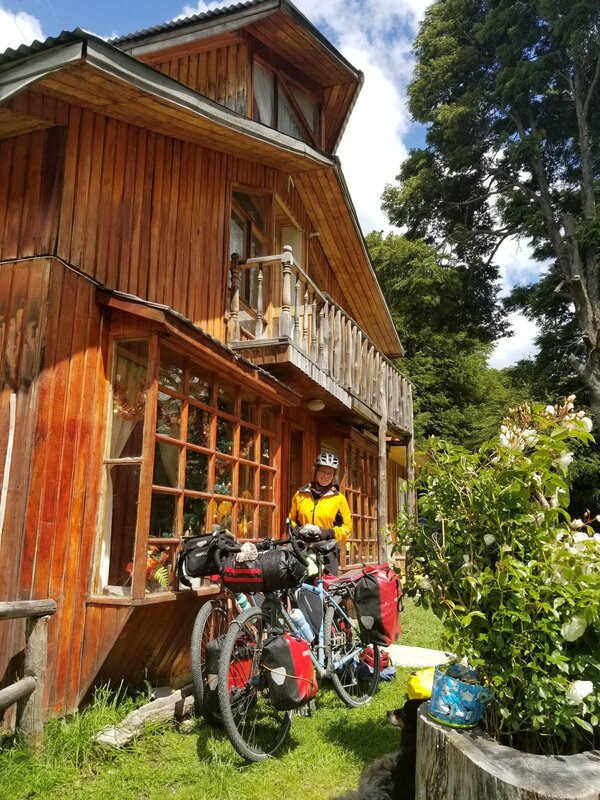 It was a soggy few hours of slogging through the washboardy road lined with big-leaved wet vegetation and bird and frog noises we had never heard before. As like every other day, nothing stayed constant, and the valley widened, the sun came out, the wind blew at our backs, and a little cottage restaurant appeared just as we needed a break and dos cervasas and some carne y tomatos. It was sooooo hot Iwas ready to go swimming in the turqueza coloured lake. But my traveling mates said it was cold. We debated. I lost as usual. The road did not get any easier to ride. Check out that sign? They even paved 100 m of the steepest bit because it exceeded the angle of repose for small boulders and bicycles. J&E appreciated that. I yawned. At last! Puerto Rio Tranquilo. Yeah!